Home PSA Remagen Announces Retrofit Safe Room Systems to Harden against School Shootings and Tornadoes. 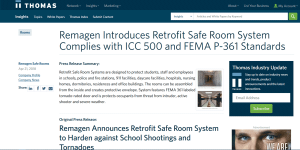 Remagen is pleased to announce its retrofit safe rooms, which may be entirely assembled from the inside, and provide a protective envelope within the former room or corridor. Given the rise of active school shootings and workplace violence in the United States, the Remagen safe room solution can be used to protect students, staff, and employees by hardening schools, emergency operations centers, police and fire stations, 911 facilities, daycare facilities, hospitals, nursing homes, dormitories, residences, and office buildings. Additionally, the Remagen Safe Room System complies with the storm shelter requirements of ICC 500 and FEMA P-361 for protection of occupants from forces and debris impacts of 250 mph EF-5 tornadoes. Other than the heavy steel, FEMA 361 labeled tornado-rated door, the completed safe room retains the character, appearance, and functions of the former space while providing unseen hardened walls, ceilings, and vent protective cowlings that will resist the enormous forces and debris impacts resulting from the direct hit of the most severe tornado. With a Remagen Safe Room System, retrofit, building occupants have safe and immediate access to an interior tornado shelter for protection against the most severe weather or from the threat from an intruder or active shooter.